Sanaa's walls profile people gone missing under the Saleh regime. Credit: Rebecca Murray/IPS. SANAA, Apr 1 2013 (IPS) - Yemen has launched its six-month National Dialogue but creating a just law is proving a formidable task. The debate is being conducted through a conference that finally kicked off in the capital on Mar. 18. The Dialogue is designed to unify the fractured country since ex-president Ali Abdullah Saleh’s ouster. Nasser Asbahi’s violent and meaningless death is one of hundreds to for such dialogue to address. 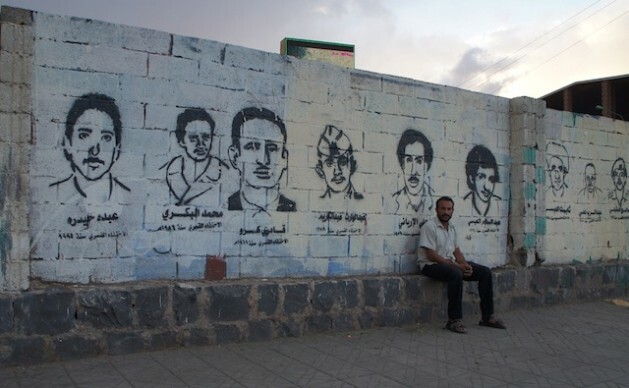 On the morning of Sep. 18, 2011, Asbahi, a 34-year-old father of three, left his construction job early to join the protests in downtown Sanaa against Saleh’s three-decades-old rule. Nasser was shot at four times by government security forces, with a bullet to the head, two to the chest, and another to his stomach. Abdullah Al Alafi, 17, a former student of Nasser’s and eyewitness to his death, said Nasser’s dying words were to urge him to leave the violent chaos, saying, ‘I think it’s too late for me’. The same forces killed Al Alafi with six bullets the following day. Over 2,000 people were killed, and an estimated 22,000 injured during the revolution. Saleh’s resignation in February 2012, in exchange for immunity brokered by Gulf Cooperation Council (GCC) states with U.S. support, paved the way for President Abdurabu Hadi’s one-candidate election and the National Dialogue. But there is widespread public outrage at Saleh’s status, which allows him to retain his Sanaa residence, his amassed wealth, and position as head of the long-standing political machine, the General People’s Congress (GPC). President Hadi is the party’s deputy. Nasser’s sister Fikriah is adamant about her demands. But what justice means to all Yemenis remains unclear. Aziz Alsurmi, co-founder of the national Yemen Centre for Transitional Justice, explains. “People will not feel relief that a little justice has taken place unless we go through stages of transitional justice,” he says. Alsurmi agrees that the terms for immunity and reparations needs to be defined, as well as which time period the investigation should cover. Transitional justice is intended to span civil wars, southern grievances of discrimination, land theft and a redundant workforce, as well as the forced disappearances and detention of political opponents, and massacres committed in 2011. While some Yemenis argue for an inquiry to start at the end of British rule in 1967, others point to the beginning of Saleh’s rule in north Yemen in 1978, or from the unity of north and south Yemen in 1990. “We will create unhappy people if we select a certain time frame,” Alsurmi says. A damning report by the Office of the High Commissioner for Human Rights (OHCHR) prompted a presidential decree signed on Sep. 22 last year, which established a Commission of Investigation focused on human rights violations committed in 2011. Seven months later, it is still not set up. More far-reaching legislation, initially called the ‘Transitional Justice and National Reconciliation’ law was given to the president when the working inter-ministerial committee deadlocked. Since then, the president’s office gutted the legislation and conspicuously renamed it the ‘National Reconciliation and Transitional Justice’ law. It is now stalled in parliament. The pressure is now on the National Dialogue’s transitional justice group, announced last week, to hammer out the scope and ramifications of a passable bill. The broad National Dialogue is carved up between 565 seats, with the GPC claiming 112, followed by traditional opposition parties. Those on the revolution’s frontlines – independent youth, women and civil society – are allotted 40 seats each, in addition to a 30 percent quota for women and 20 percent youth quota, across party lines. Baraa Shiban was nominated to the Dialogue’s independent youth bloc, and is focused on transitional justice. He says it is difficult working alongside allies of the revolution’s violent perpetrators. “We have to be very careful that when we talk about victims and families of victims that we pass a law that doesn’t look like immunity to these people, but instead looks towards the future,” he says. “If the law is not passed, problems in the country will continue,” asserts Minister Mashhour.